Right whale researchers Heather Pettis and Philip Hamilton (right and middle) talk with Anderson Cabot Center VP John Mandelman (left). Heather Pettis, Philip Hamilton, and Moe Brown on the R/V Nereid. 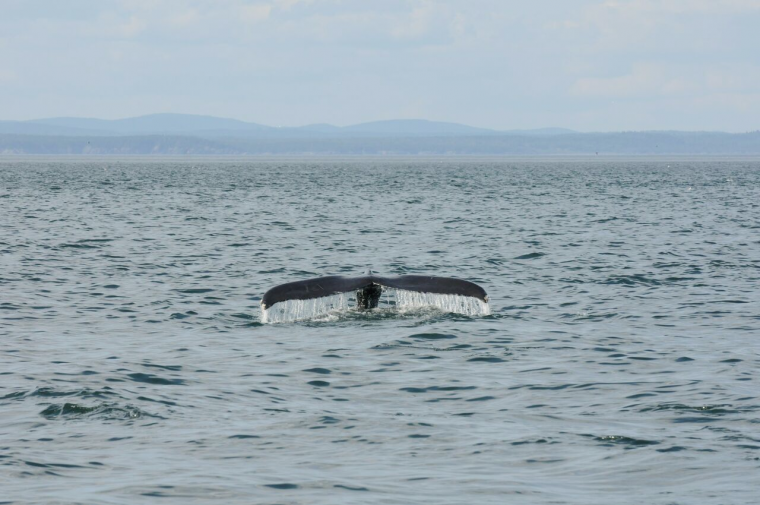 We have also witnessed a significant decrease in the size of the right whale population, which we now estimate at fewer than 450 individuals. Two factors have caused this population decline; fewer calves and more deaths. North Atlantic right whales are producing significantly fewer calves, and in 2018, zero calves were observed in their calving grounds to the south. 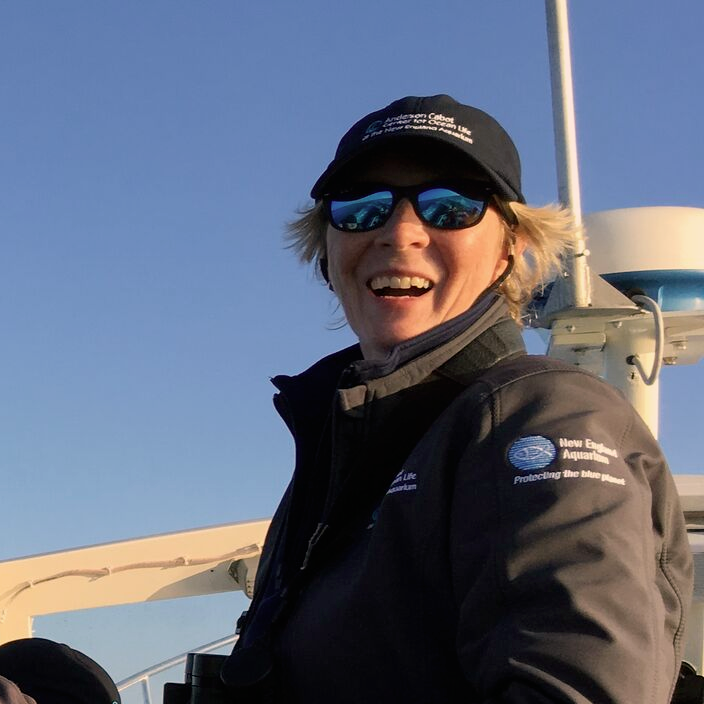 With right whales facing existential challenges to their survival, it’s easy to see our researchers’ passion, expertise, and a level of frustration just below the surface. I consider myself lucky to have stepped into their world for a few brief days. Meet the members of the team I spent my time with. Dr. Moe Brown has been at this the longest and has been talking more and more about retiring recently. 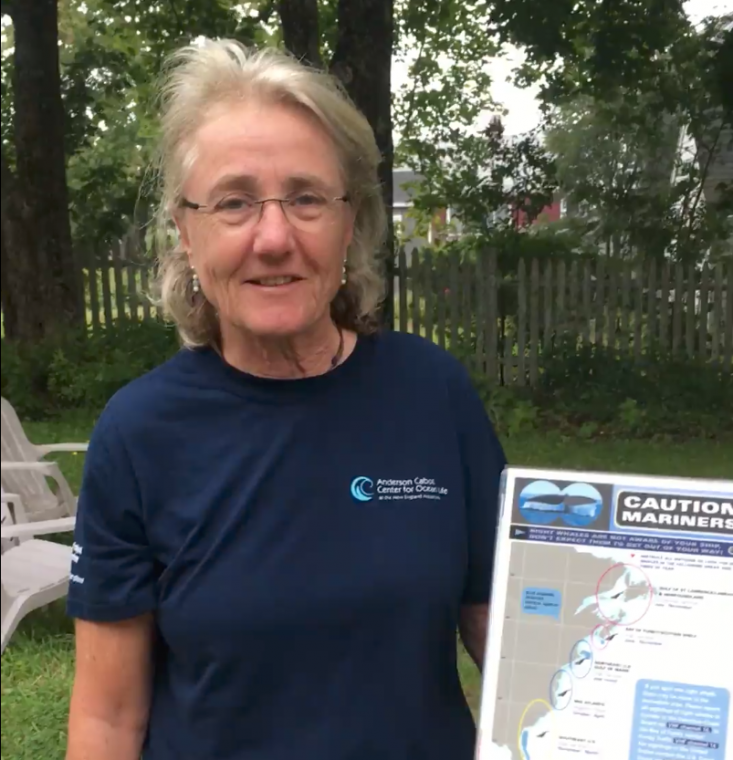 Originally an ornithologist (she kept pointing out interesting birds and their distinct behaviors during our 13-hour days at sea), Moe has been working with right whales since leisure suits and disco were popular. Along with Marilyn Marx, Philip Hamilton has been the heart and soul of this team since the mid-1980s. Philip knows most of the whales in our catalog by sight, based on their unique callosity patches. He truly has an encyclopedic knowledge of almost every individual in the population. Marilyn Marx has the best eyes on the team and is able to spot the faintest bit of movement on the horizon. She is so dedicated to protecting these animals that she will often get choked up when speaking about them. Heather Pettis is relatively new, by their standards. She joined the team in 2001. 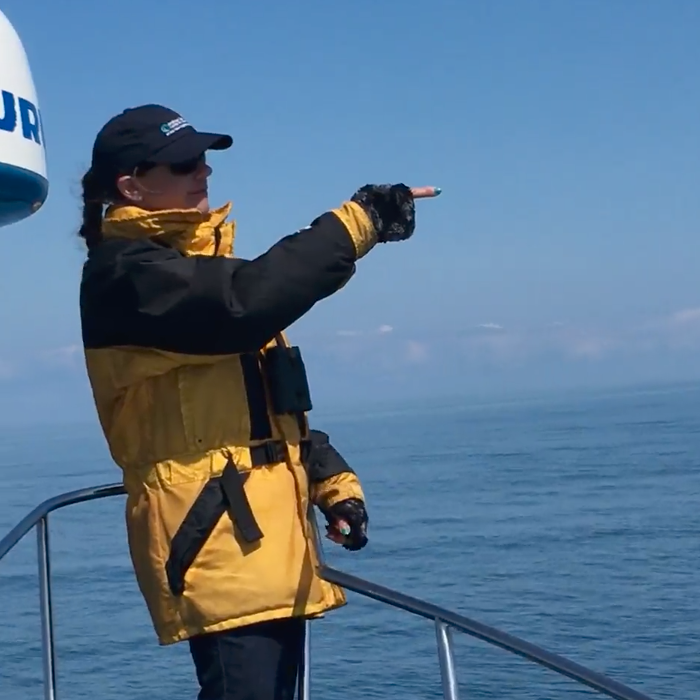 Her unending font of enthusiasm and dry wit keep the team’s spirits buoyed even during some challenging times on the water. Heather is an incredible spokesperson for this work and, even when I asked what I’m sure where level 101 questions, she was able to translate complex science into easy-to-understand explanations. Kelsey Howe is the newest addition to the team, joining as an intern in 2011, then as a full-time employee in 2016. Full of innovative ideas, Kelsey imbues this team with an infectious energy that helps everyone remember the importance of the work they are all doing. 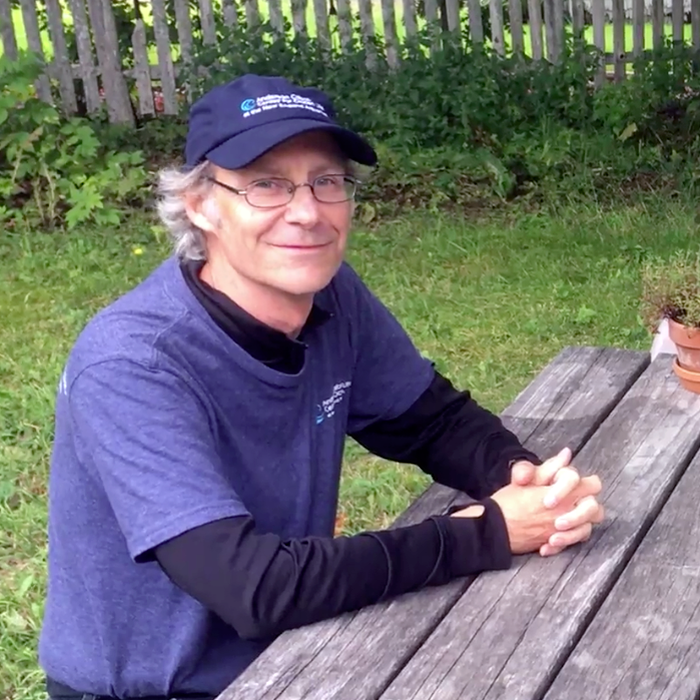 Philip Hamilton and Marilyn Marx analyze data at the Lubec field station. This group of dedicated researchers brave cold weather (even though the temperature was in the 70s on land, we were dressed in multiple layers on the boat), rough seas (parts of the Bay of Fundy have the highest tides in the world), and the challenge of protecting a disappearing species. It’s not glamorous. They don’t get paid a million dollars. They aren’t famous. But they love it. 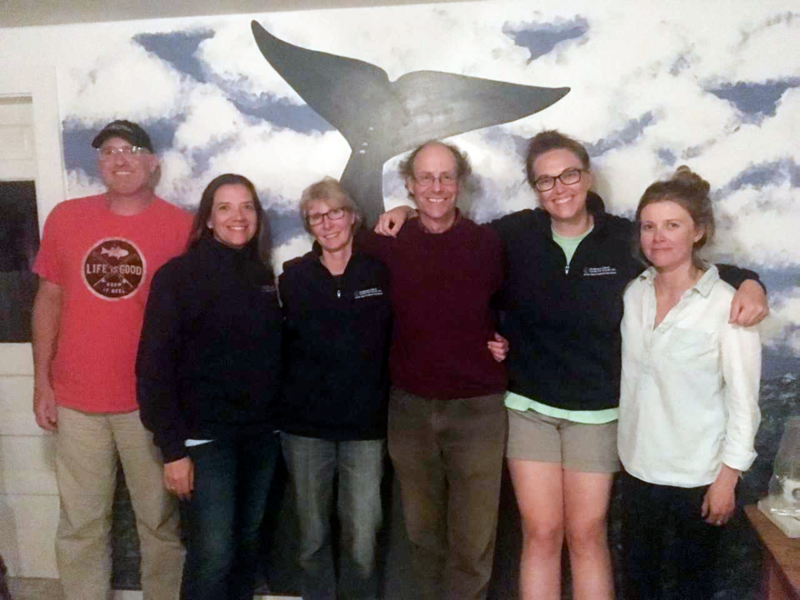 They love the ocean, they love whales, and they love being together to help solve a key challenge. And that’s what drives them. In the face of large challenges and, they’ll keep going. They’re also human and sometimes the frustration comes out. While on the water, every couple of hours we stop the boat entirely and for a “listening station.” Did you know you could hear whales breathing from miles away if you’re quiet enough? I certainly didn’t. So we all go silent and listen, hoping against hope that someone will hear the tell-tale tuba-like sound a right whale makes when it breathes. Just so we can see one of these now-elusive giants. 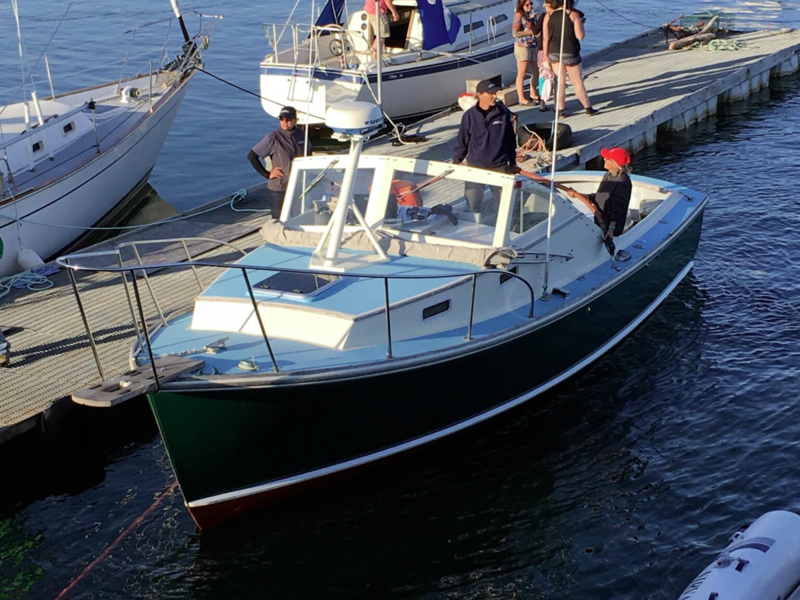 When Heather calls out “times up” at the final listening station, everyone on the boat is visibly upset. Someone makes a sarcastic joke, and everyone laughs. But the mood on the boat is different as a hint of melancholy hangs in the air. Anderson Cabot Center VP John Mandelman looks over the glassy water in the Bay of Fundy. A humpback whale dives beneath the surface. 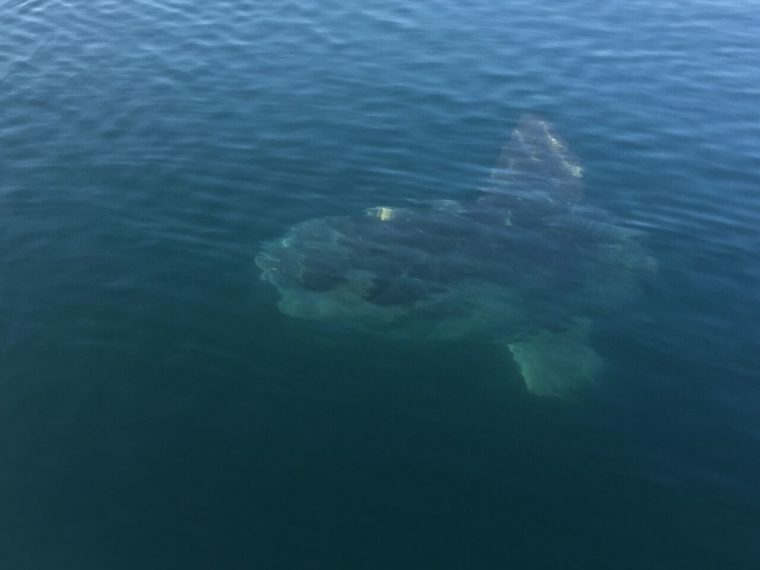 An ocean sunfish (mola mola). I was lucky to have ideal conditions the day I spent on the water with this team. 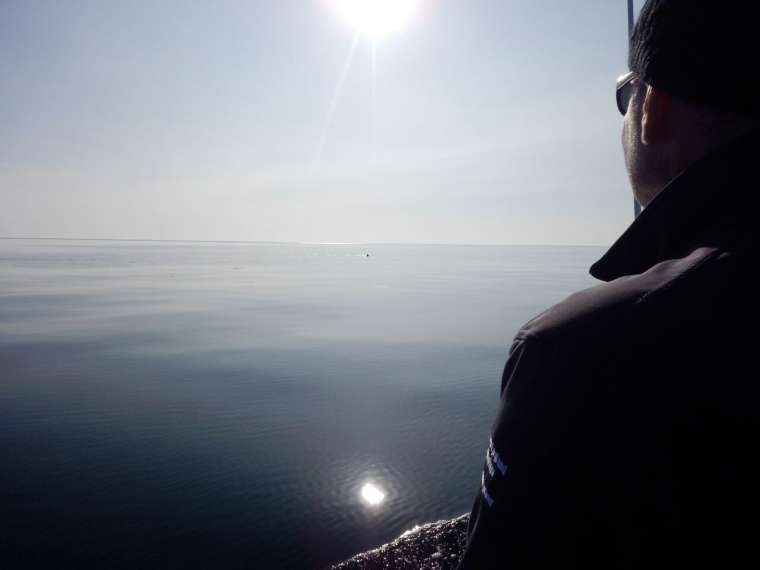 Water like glass and high visibility perfect for spotting right whales. But the right whales didn’t cooperate and we turned back to the dock without seeing even one right whale. As we pulled back into Lubec, everyone was keeping a positive attitude, pointing to the beauty of the cliffs on Campobello Island, sharing funny stories of past rides, spotting bald eagles, and marveling at the fact that we saw 38 mola molas (interesting-looking fish that usually aren’t this far north – although that’s a story for another blog). As I watched the sun start to set over the quaint town of Lubec, I realized that these people are heroes. They’ll come back out to the water tomorrow and keep doing the work to make this world a better place no matter what. They won’t let frustrations stop them because that’s simply not how they’re wired. This world needs more people like Moe, Phil, Marilyn, Heather, and Kelsey. And for the rest of us mere mortals, we need to help them in any way we can. 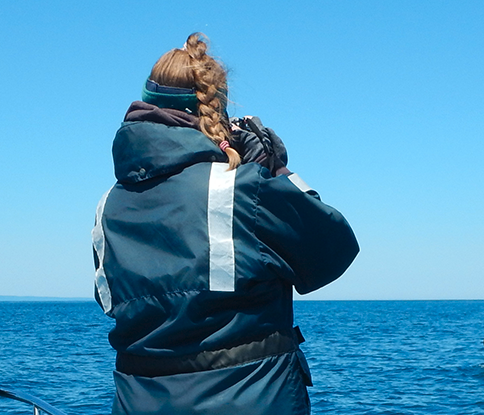 Learn more about the Right Whale Research at the Anderson Cabot Center. Read more stories from the 2018 Field Season!